Marinus Catiotus is an Imperial commoner living his life at ease in the Elven Gardens District of the Imperial City. He claims to be an "associate" of Acrobatics expert Ida Vlinorman, but in reality they are only neighbors and Ida never even mentions Marinus. He also claims to hate big city life with a passion but seems to get along just fine. He owns one of the expensive mansions in the heart of the District and sleeps on the second floor every night between midnight and 6am. On a typical day, he spends all morning wandering around on the ground floor until midday when he heads outside for a breath of fresh air before lunch. At 1pm he enters the King and Queen Tavern for a two-hour meal and some socializing with the other regulars. He exits the tavern at 3pm and strolls around the Elven Garden District for three hours before finally heading back home for a two-hour dinner. The rest of the evening is spent relaxing on the ground floor until he finally heads upstairs and finds his bed at midnight. He breaks off this routine on Morndas, Middas and Fredas for a morning prayer inside the Temple of the One from 8am until midday. On the 4th of each month, when the clock strikes 6am, Marinus gets out of bed and leaves the Imperial City for a long and dangerous journey towards Anvil. He crosses the Talos Bridge and heads south on the Red Ring Road before finally heading west on the Gold Road while doing his best to avoid the wildlife near the many Ayleid ruins and caves. He reaches the famous vineyards near Skingrad after twelve hours of traveling and finally reaches Anvil at 10am the next morning. Once there, he heads down to the dockside and enters The Flowing Bowl for two days of drinking and chatting with the pirates and regulars. At midnight on the 6th, he heads back home to his life in the Imperial City. His wardrobe is middle-class and typical for an Imperial. It consists of a red burgundy linen shirt with matching linens and a pair of quilted shoes. He does not wield any weapons and he only carries his house key and a meager amount of gold. When approached for the first time, he will introduce himself and talk about his non-existent relationship with the Acrobatics trainer next door: "Marinus Catiotus. Ida Vlinorman and me, we're associates. Same interests, same styles." 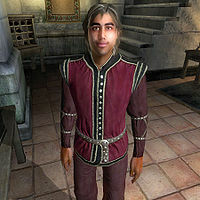 When asked about the Imperial City he will say: "This city life is killing me. Work all day long. Drop dead and they toss you in Lake Rumare. Just need to make my money at the Arena and live easy." This page was last modified on 22 June 2018, at 04:30.